As always, I feel silly sharing a recipe that's more about construction than actually cooking. 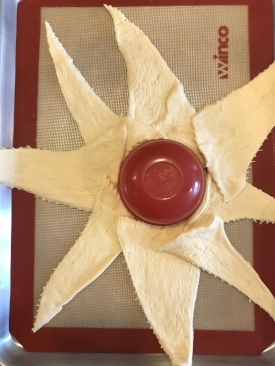 It has been ages and ages since I've made a crescent roll ring but recipes for different versions keep popping up in my social media feeds (thanks, Buzzfeed) so I thought it would be a good addition to our Eggless Easter brunch suggestions. The very first time I made a crescent ring was also with a scramble filling and I made it at my parent's house, it was one of the first times I cooked anything vegan at their home. I thought I was cooking for myself and that I would have leftovers for quick breakfasts. Didn't happen. I left the ring of doughy goodness in the kitchen and returned to find that my Dad ate the ENTIRE thing. He didn't even realize it was entirely vegan, he just thought it was delicious and went to town. I guess I'm including this as a warning to anyone who wants a second helping; get it while you can because the combination of crescent rolls and...pretty much anything, is too good for anyone to pass up. Find a circular object to use as a guide for the center of your ring. If you're serving with a sauce, I would use the container for that sauce so it can sit in the middle. Unroll dough sheet. Use the longer side to create a sort of 'sun' shape around the object in the middle. Lay the pieces over each other so there's a solid ring of dough at the base. Fill with tofu scramble! I used our Simple Tofu Scramble recipe and added cheese. I used an ice cream/cookie scoop but I don't think that's entirely necessary. Bring the pointed ends towards the center and press down to pinch the dough together. You can also tuck the dough underneath the base for a tighter roll. Do this until the tofu scramble is entirely enclosed. Bake 20-22 minutes, until golden. As always, STUFF FACE. But probably wait like 5-ish minutes so you don't burn yourself. I have to make a confession: I'm a sucker for all of those Buzzfeed 30 second cooking videos. They're rarely vegan and almost always unhealthy but I love watching them. When Tasty posted a video for omelette cups with tater tots as a 'crust', I knew I had to make them vegan. We love scramble in this house; it's easy, provides protein, and is a good vehicle for all sorts of different flavors and sauces and sides. The possibilities are endless for mix-ins! Since we're eating gluten free these days, we've replaced our usual Sunday bagel date with a Mother's date that includes their scramble plate with the green chiles, mozzarella and avocado on top. I made these cups using those ingredients because the combination is just so good that I couldn't resist. These cups come together really easily and you can mix it up- make 6 with mozzarella, make another 6 with cheddar, etc etc. They're good reheated and an excellent option if you're hosting a brunch or even bringing along your own vegan dish to a potluck. 2. Microwave 36 frozen tater tots for 1 minute, just enough to make them able to be 'squished' but not so they're falling apart. 1 minute did the trick for our microwave, but you know the strength/power of your microwave so use your judgement here. 3. Push 3 tater tots into each cup of your cupcake pan. I used a spoon to squish the centers together to make a cup. 4. Bake your tater tots for 8 minutes! 5. While the tots are baking, make your omelette batter. Toss the entire container of silken tofu, 1 packet of RATIONS, corn starch, and milk into your blender. Blend until it looks and smells like an egg milkshake. 6. Take the tots out of the oven and assemble your omelette cups. 7. I put a teaspoon of green chiles in each cup and then topped each cup with some Daiya Mozzarella. 8. Evenly distribute your omelette batter across all of your cupcake cups and then carefully lift the pan and drop it on the counter. DON'T DO THIS TOO HARD OR FROM TOO HIGH, or the batter will splatter and you'll smell like sulfur :D I do this to make sure enough of the batter trickles down over the mix-ins and into the crevices the tots create. 9. Bake for 25 minutes! 10. At 25 minutes, I turned the oven off and kept the omelette cups in the oven for 5 minutes, just to make sure the middles would firm up. 12. Use a knife to cut around the edges of the cups if they stick to your pan at all. 13. Serve, eat, enjoy! OR Refrigerate and save for the rest of the week!